What to do in a home lab, where you haven't got a proper DNS with reverse lookup using PTR records, as explained in the VMware vSphere 5.5 Documentation Center? 1) Put together a Windows Server + SQL Server system or VM somewhere, and add the full 3.3GB installer vCenter to it. But that's a whole lot more complex, and time consuming. Good when studying for certification, not necessarily good to keep running at home 24x7. 2) Get another Windows system and run a light weight DNS on it, such as Simple DNS Plus. Keep in mind you'll want to keep it running, always, especially when rebooting the appliance. 3) Tweak your hosts file. Option 3 works great for my needs. If you want simplicity and no additional cost*, take a few seconds to make just the right tweaks to the VCSA's host file, right before running the wizard. Yes, the workaround is essentially that simple, see "The fix" section below. No nasty errors or side effects that I've seen so far. If you want to use the friendly names for the bits an pieces of your lab like esxi and vcenter, then optionally, tweak the hosts file on your workstation as well. Yeah, not super elegant, but it works. *Best parts of VMware’s ESXi 5.5 free hypervisor rely on vCenter, which isn’t free. Uh oh? Very small inventory (10 or fewer hosts, 100 or fewer virtual machines): at least 4GB. Having used it for some months now, I've noticed it seems to settle down over time, and only shows about 0.5GB of active memory use with 2 VMs running, seen pictured above. Save this new hosts file. Now when you run the wizard, and choose 'Configure with default settings' it'll actually complete without errors, takes about 5 minutes on an SSD. Optionally, add these same 2 lines to the EXI hosts /etc/hosts file, but I've found no problems with not bothering with this. 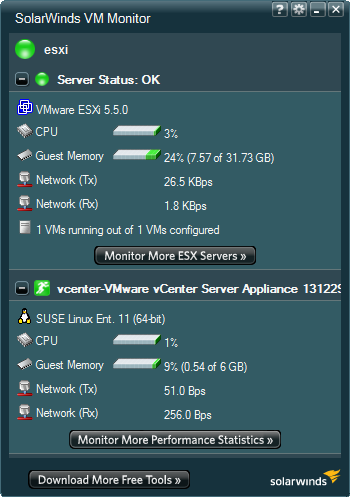 vCenter adds ESXi to inventory by name, without incident, without warnings or errors. Reboot the appliance (or the entire ESXi host), to ensure the appliance comes up automatically, without errors, and you're able to login with the vSphere Client and vSphere Web Client. Previously, I had developed a less elegant, and more complicated, solution, based on using DHCP reservations for a fixed IP address in the VM. I feel tweaking the hosts file is a better approach. Now that you've got your appliance working, drop a comment below and let us know! I'm always open to corrections, better ideas, and constructive feedback, of course. New comprehensive, beginning to end build video now available. You'll see I'm using the same technique to build the VCSA without SSO errors, as you witness me building my lab, in this hour long video.